Occasionally when I encounter something new (new to me, at least), for days or weeks afterwards that thing will seem to randomly pop up everywhere — on TV, in news stories and in conversation. Eventually, it will feel like Kismet. Sometimes it’s a buzzword, the newest one at my office being “unpack”, which apparently means to explain something in more detail, as in “can you please unpack that a little?”. These days, I’m finding that at least one person uses that phrase in every meeting I attend. And unfortunately, I attend a lot of meetings. It can also be a book, a place or some piece of totally random news that folks keep bringing up as part of idle chit-chat. This week, the topic everywhere was… razors. Specifically, companies that sell razors and razor blades in bulk, online. I’m not surprised that they exist, although I have never heard anyone mention them before. It’s probably economical, since men who shave every day go through a lot of razors. And razors are small, so unlike toilet paper or diapers or gallon jugs of olive oil from Costco, it doesn’t take a lot of space to store a year’s worth. 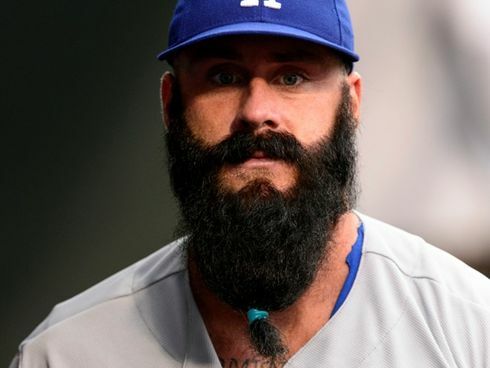 Online razor retailers weren’t exactly newsworthy until… Brian Wilson, a.k.a. B. Weezie, also known as the Beard… and the former closer for the San Francisco Giants. This week, co-founder and president of 800Razors.com, Philip Masiello, offered the Weezer $1 million to shave off his beard — a sum equal to his recent one-year contract with the Los Angeles Dodgers (hiss). Wilson turned him down, which is either brave or stupid. I’ve not yet decided. In fact, he kind of thumbed his nose at the idea by wearing a hideous scrunchy thing in his beard at his next outing. What was that about? It’s not like his beard is fly-away and lacks density. It’s more like a garden hedge, and even in an F5 twister that thing is unwavering. The day after Brian Wilson declined the offer to double his salary – and thereby failed to recapture his place among the world’s dreamiest baseball players — I attended a professional webinar about effective storytelling in advertising. One of the examples provided to demonstrate how humor in advertising can generate engagement was from another razor retailer DollarShaveClub.com, which has a tagline of “Our Blades Are F***ing Great”. So is this video. If Brian Wilson had seen it, do you think he would have laughed… and then reached for his shaving cream?